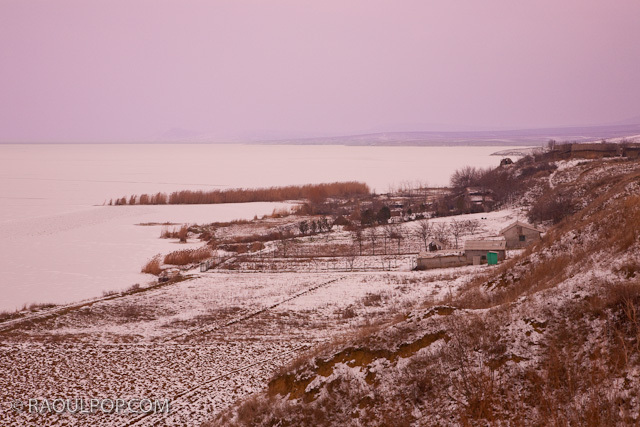 This is a lake near the city of Babadag in Dobrogea, also called Babadag. It connects with a larger lake called Razelm beyond the horizon. â¨â¨There are people who live in those houses — some might call them hovels. These are people who work their land, as you can see, and fish, and do what they can to make a living. You can’t believe how rough a living it is though. â¨â¨That little green box you see toward the middle of the photo is an outhouse. The lake doesn’t flood often, but when it does, their houses are in for it. And in the winter, it is incredibly cold over there. You can’t imagine how cold it is, but I can, and it wasn’t even a particularly cold day when I visited the area. I couldn’t move or feel my fingers after a few minutes of handling my camera in the open air. The sharp, strong wind cut right into my skin and penetrated to the very bone.